Like every new Expert Author, Stephen has encountered many challenges. Those he considers to have faced consistently include providing an in-depth explanation of a concept and writing captivating titles as well as a compelling Resource Box. To overcome these obstacles, Stephen turns to reading, research and testing, as well as EzineArticles many tools and resources. 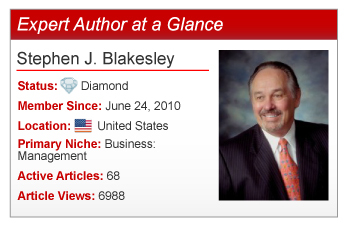 “EzineArticles works hard at working in a professional way with their authors,” he commented. “They produce a professional product and help others to do so.” As a Premium level member, Stephen claimed, “my favorite Premium member benefit is the quick turn-around on article approval.” Stephen has also added many of EzineArticles free tools and resources to his article writing efforts. “I find the tutorials to be beneficial. I have watched many of them multiple times….” he said. Take Stephen’s advice and begin writing your next set of quality, original articles to establish yourself as a leading expert in your niche today. Do you have a question or comment for Stephen? Feel free to leave it in the comments section below. Nice to meet you- my question was where do you find most of your material comes from for writing-thanks for your time-Have a great day on purpose! I agree with you that quality can be more important than quantity. However, there is a certain pride and emotional rush from producing many, many articles, as I did in the 100 articles in 100 days challenge. Not sure I would attempt that again. It started out easy since I had many article ideas floating in my head and written on pieces of paper. But at some point I felt as if I had hit the wall (in marathon runner language) and I had to press forward to continue to come up with new ideas for articles. I prefer a slower pace and writing as I feel inspired by specific topics or events. EzineArticles has helped me SO much with my business when I was starting out. Glad to see that Stephen’s efforts have been recognized. To put out quality content consistently can be a struggle and I can appreciate that too. Great work Stephen! Coming in contact with you, a man with a lot of experience for half a century is a blessing. I have learned from your write up not to rush for quantity but go for quality, and that will do. Stephen has some excellent articles, not just filled with facts, but also timeless wisdom, everyone who wants to succeed in business or life for that matter ought to take note. I have always a problem of missing or overlooking of what I wrote. In words, I say it or compose it from my mind but I don’t the exactly either write or type the typical sentences or words. Also, if event] I read what I wrote; I cannot detect or find out of my mistakes. I do silly mistakes I write something and it surprises me when some else proof reads after me and finds my idiotic errors. So Mr. Stephen, since you have been writing for a long time and what is best you could provide with problem. One thing I can say for certain. Most people are not capable of proofing their own writing. Write and ask someone else to proof it. Then proof it again yourself. Zebra, don’t put yourself down so much. Many excellent writers have the same problems that you have. You are doing a good thing when you ask others to edit your content. And as you go, your will learn to recognize your errors. One suggestion I could mention is that I read my material from right to left when I edit and, believe it or not, that helps me to catch my errors. And they are not “iidiotic”, just mistakes. I completely agree with quality over quantity. The best articles take time to research, get interviews for, and write well. I admire your making that choice!